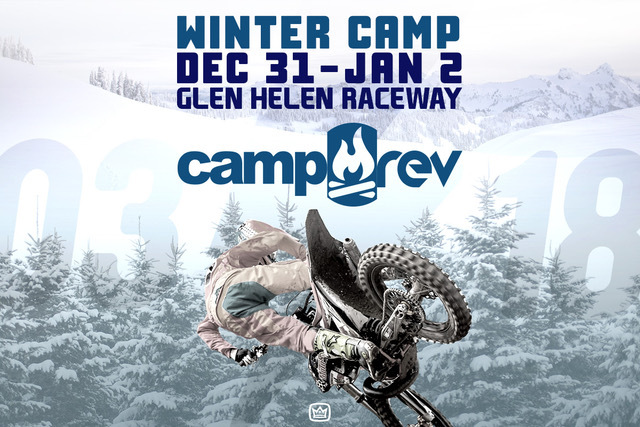 PanicREV is excited to announce their WINTER CAMP at Glen Helen Raceway in Southern California on December 31st, January 1st, & 2nd! CampREV is designed to help give riders a solid spiritual, physical, and technical foundation through our world class program. CampREV is set up for riders of all ages and skill levels that are looking to take their skills on the racetrack to a new level! This is achieved by breaking everyone up into groups based on their ages and skill levels. CampREV features daily chapel services and prayer, in addition to refining skills such as conditioning, corners, jumping, starts, riding position, technique and a whole lot of FUN! Come bring in the new year with us at Glen Helen and have the time of your life! We are encouraging everyone to camp, hang out and fellowship together during camp. Dry camping is included in the price of the camp. Hook-up spots are now full, if you would like to be added to our waiting list please email us at info@panicrev.org with your; Name, Email, Phone Number, and that you are requesting a hook-up spot for the Glen Helen Camp. No refunds will be issues after Dec. 14th at 5:00pm PST. There will be a $60.00 cancellation fee for any cancellations.